Marin Video Center can digitize and transfer your old 35mm, 16mm, Super or Reg. 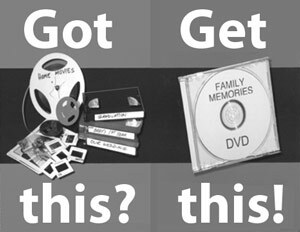 8mm films, photos, slides, or videotapes to DVD. This is the way to archive your family history for generations to come. Imagine watching your family's story unfold on TV with titles, music or narration provided by you. What a precious gift for the entire family, children and grandchildren. Marin Video Center makes it easy! Just call 415 755-8984 to take your "home movies" to a whole new level. Marin Video Center offers custom editing of your materials into an enjoyable photo montage, music video, mini-movie or documentary that will be a family treasure!